Hello! I hope you’re having a cozy winter so far, and if you’re done with winter, hang in! Only a month or so to go! My days have been filled with posting vintage items into Posy’s shop, navigating the shopping feature on Instagram, applying for vintage markets, reviewing last year’s numbers and putting them to use for 2019’s goals and lots of baking, organizing, listening and reading. I thought it’d be fun to do a round up for you of my current February faves! Adjust oven rack to middle position and heat oven to 375 degrees. Spread oats and pecans evenly on baking sheet and toast in oven until fragrant and lightly browned, 7-9 minutes; let rest on wire rack. Increase oven temperature to 450 degrees. When oats are cooled, measure out 2 tablespoons for dusting counter and set aside. Line second baking sheet with parchment paper. Whisk milk, cream, maple syrup and egg in large measuring cup until incorporated. Reserve 1 tablespoon in small bowl for glazing and set aside. Pulse flour, baking powder, and salt in food processor until combined, about 4 pulses. Scatter butter evenly over dry ingredients and pulse until mixture resembles coarse cornmeal, 12-14 pulses. Transfer mixture to medium bowl and stir in cooled oats. Using rubber spatula, fold in liquid ingredients until large clumps form. Mix dough by hand in bowl until dough forms cohesive mass. Dust counter with 1 tablespoon reserved oats, turn dough out onto counter, and dust top with remaining 1 tablespoon reserved oats. Gently pat dough into 7″ circle about 1″ thick. Using a bench scraper or chef’s knife, cut dough into 8 wedges and place on prepared baking sheet, spacing wedges about 2″ apart. Brush tops with reserved egg mixture and sprinkle with 1/2 tablespoon sugar. Bake until golden brown, 12-14 minutes, rotating sheet halfway through baking. Let scones cool on sheet on wire rack for 5 minutes, then transfer to wire rack and let cool to room temperature, about 30 minutes. Serve. One of my favorite designers, Emily Henderson, just welcomed a new member to her team, Michael, whom she’d first met at the Rose Bowl Flea. He loves vintage, thrifting and wrote an enthusiastic and fun post “7 Tips for Creating a Unique Home You Really Love” (hint: a big part of his suggestions is to incorporate vintage!). When you have a moment…perhaps with a scone in hand…give it a read! Also, I’m really excited Emily’s bringing back her features on trolling Craig’s List for their best finds, city-by-city, as well as DIY projects for the home and more thrift store finds and tips. Emily, and now Micheal, do a terrific job showing you how to bring in the vintage and mixing it with the new. A podcast that really struck a chord and I can’t stop thinking about is the episode “Finding More Life In Less Stuff” on the Young House Love podcast featuring an interview with author Joshua Becker. He is the author of “The Minimalist Home,” which I can’t wait to read. The way he talks about not wanting to be a manager of stuff, and what are we really working for, is exactly how I’ve been wanting to live my best life. He’s not saying get rid of everything, but he is preaching “rational minimalism.” As a business owner, who is selling tangible things, this really helped me focus my goals with Posy and how I want to be a resource for those special gifts as well personable items in your home that invoke positive memories or connection to a loved one, and not just selling stuff. I highly recommend listening! My sister-in-law, an avid reader, gifted me with a beautiful book for Christmas that I recently finished. 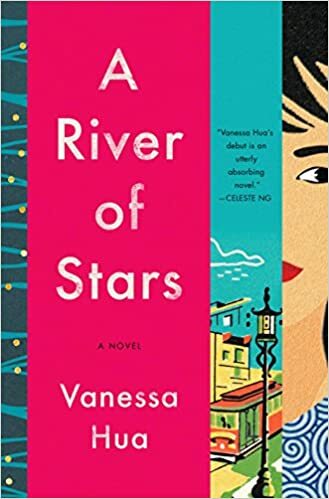 It’s Vanessa Hua’s debut novel, A River of Stars, and is story of motherhood, friendship and creative survival. Really special book! Alright, time to get back to washing out turquoise mason jars and posting quirky “new” planters into the shop! Keep an eye out on (@posymarket) Instagram for the latest shop updates and peeks into beautiful old homes as well as inspiration for incorporating your thrift store finds into your space! And if you really want to be in the know, and get a discount on your next Posy purchase, be sure to sign up for the Posy Post (our quarterly newsletter)! Last year I missed Raleigh’s Urban Vintage market and was really disappointed, so I was thrilled to have Posy back this go round! Tracy does a fantastic job organizing and marketing the market and really draws in the shoppers…there were lines both days of the event. And folks came ready to buy…excited for a true vintage market! The market was held in the lovely historic space of All Saints Chapel in downtown Raleigh. Hardwoods and air conditioning…doesn’t get any better! I was lucky enough to have my booth placed across the aisle from Melanie’s delicious confections baked for her shop Sweetest Things. She kept me fueled on pineapple upside down cake and an amazing lemon curd-filled cake! On my other side was the talented Lynda of HangarOne Design out of Chapel Hill. She reimagines vintage furniture by breathing new life into chairs and benches. Always feel so lucky when I make a new vendor friend and have support during a show. Having a big space meant I could stock items for markets that I don’t want to sell online…toolboxes, chairs, globes and art. The mustard-colored upholstered office chair, along with the wooden folding chairs, went quick as did most of Posy’s globes. It always amazes me, market-to-market, what customers are drawn to. The kids books I’ve had for a year, flew off the shelf, on their way to become gifts for little ones and new moms! Overall, Urban Vintage market is a terrific event in which to participate, and I loved seeing the variety of true vintage surrounding me…two floors worth! A big thanks to Tracy and everyone that came out…even the neighboring firefighters! Whether you’re tackling some spring cleaning, or just want to focus on fixing up your latest vintage score, the tools you need are right in the kitchen! Recently, my husband accidentally placed a still-wet bowl on our vintage wooden sideboard table, leaving a white ring behind. At first I panicked, and then after a surprising online search, discovered that the mayo in our fridge could remove it! I learned from Bob Vila that the light mark is actually a sign that the moisture is trapped in the varnish and hasn’t gotten through to the wood yet. He suggests ironing, which I don’t recommend. It left more marks, rather than removing the ring. I followed his steps for using mayo, “Dab a bit onto a rag, then gently apply the mayonnaise directly to the stained area. Let it sit for at least an hour or as long as overnight, reapplying the mayonnaise if the initial coating dries out.” I left my mayo for a few hours and it did the trick. You can’t even tell where the stain happened! Personally, I’m team patina, but I know not everyone likes their brass that way. So, if you’re team shine, there’s an easy way to bring it back! Using Apartment Therapy’s guide to cleaning brass, you can mix the juice from 1/2 lemon with 1 teaspoon or so of baking soda, creating a paste that you can apply with a rag or toothbrush. What I love about this technique is that it doesn’t completely strip the brass of it’s vintage patina, making it look brand new. You buy vintage because it’s vintage…not something that can be easily found at any big box store. Also, as a sidenote, the Oxo brush is amazing…small head, firm bristles and this little rubbery pointy nub on the other end that’s great for crevices. Be sure to check to see if your piece is actually brass first! Use a magnet…if it sticks, there’s probably another metal at play, but if it doesn’t, then you’ve most likely got a true brass piece. Finally, some folks are wary of taking home a vintage piece that has a less-than-pleasing odor, but there’s a remedy for that too! When it comes to containers, or things that have been closed and left for long periods, an odor naturally develops. As long as there are no signs of mold or other serious issues, I typically have found that some baking soda, coffee grounds or even tea tree oil can nip that stinch in the bud! For plastic containers, like Tupperware or thermoses, I’ll simply shake a good amount of baking soda into the container, covering the bottom, and let it sit with the lid off. I’ll even put a layer on the underside of the lid, as I don’t want to trap the scent back in there next time it’s closed. For jewelry boxes or wooden furniture, sometimes I’ll put sprinkle baking soda directly on the piece and later vacuum it up, or you can put the baking soda, or even coffee grounds, on a small plate inside the piece to soak up the scent. If it’s something washable, like glass, I’ll use diluted white vinegar if the dish soap doesn’t do the trick. Another great trick, I learned when my kids were babies and I was using a Diaper Genie to dispose of their diapers, is a little dash of tea tree oil on a piece of cloth left in the container. It’s a great odor neutralizer! Alright friends, I hope this was helpful! Happy spring cleaning!